NOT What He Had in Mind! 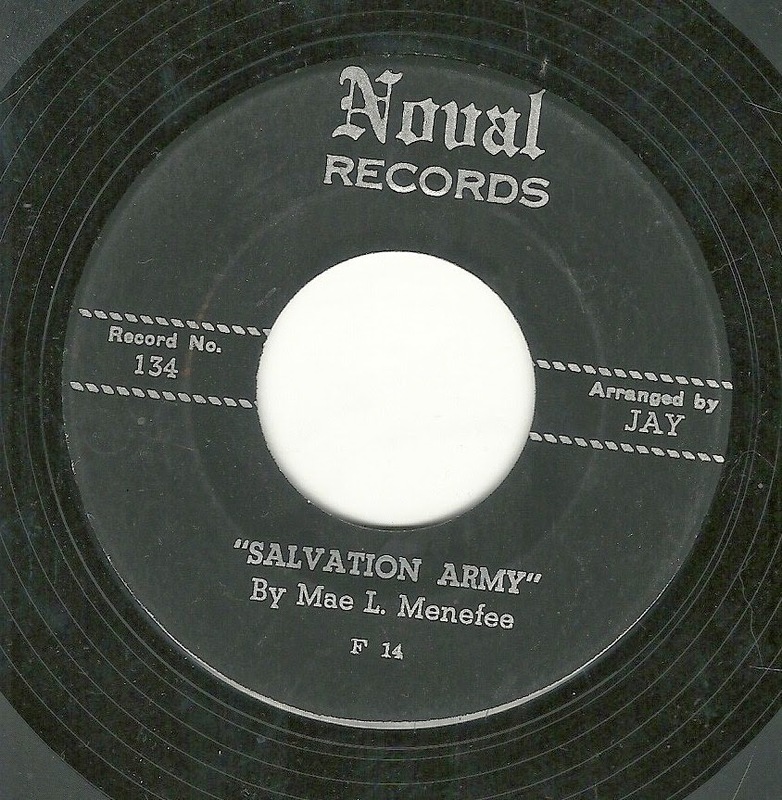 Given the title of this record, and the current hype here in the U.S. over all things basketball, I felt a strong pull to name this post after a catchphrase frequently uttered by sportscaster Marv Alpert. It seems appropriate. However, I was also tempted to name this post "Thank God for Gary Roberts" or "The Inimitable Gary Roberts". 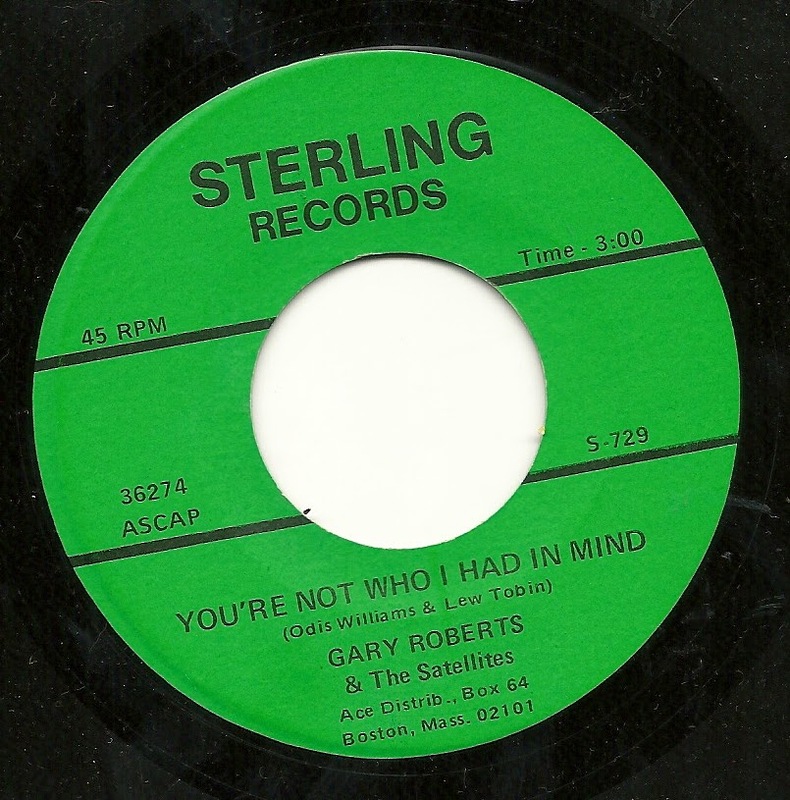 For every time I get to hear a Gary Roberts record, I feel that, in a way, my day is complete, but in another way, I feel cheated - there are so FEW of them! Why can't there be as many Gary Roberts records as there are Mike Thomas records. 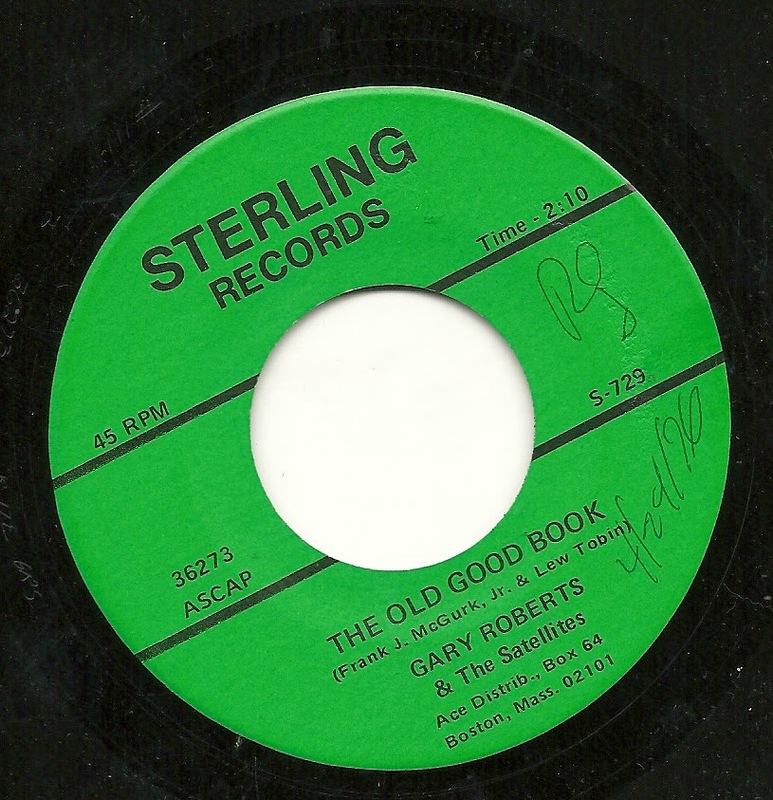 For as many of you know, Gary Roberts was singularly unable to look at a piece of music and sight-read it effectively, while simultaneously sounding like he knows the song AND sounding like he's the least bit involved with what he's singing - all of which are key talents for a song-poem vocalist. He is, in a sense, the anti-Gene Marshall. His greatest moment has to be "Do You Know the Difference Between Big Wood and Brush" (I'd throw a few votes towards "Keep Those Hopes Us" for second place). But today's feature is no slouch either. Part of the credit goes to the fairly awful lyrical content here. Really, who'd want to have this set of words directed towards him or her. 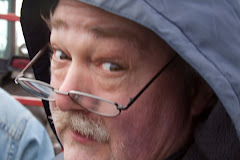 It certainly sounds like the writer plans on staying with the beloved to whom the words are directed, but those words are largely ones of complaint and dismissiveness, aren't they? And don't phrases like "a challenging disappointment" just slip freely over this midtempo shuffle beat? and say "I love you". But you're not who I had in mind. It's hard to make those words worse than they are, but Gary Roberts' hesitating, soulless and flat delivery do the job. The flip side, "The Old Good Book", is little more than a schoolmarm-ish lecture set to music, although I do wonder what "My tender God care" means - perhaps I'm hearing that wrong. Gary's reading of this song again convinces me that the studio could hardly have done worse if they'd pulled in the first person walking by outside and asked him or her to sing. One Hell of an Argument! Noval song-poems are often an offbeat treat. The one's I typically enjoy feature half-assed musical performances of lyrics which are badly suited to the backing provided, sung by a guy who has problems staying on pitch. Today's feature, however, has a decent, if journeyman-like bluesy jazz backing, and the singing is considerably better than I'd have expected. At 100 seconds or so, this is one of the shorter song-poems you'll hear. Also please note that the entire song has only eight lines of lyrics, some of which are repeats of earlier lines. Here's another attempt on my part to stay relevant with what's on the calendar, by posting a song appropriate for St. Patrick's day tomorrow! 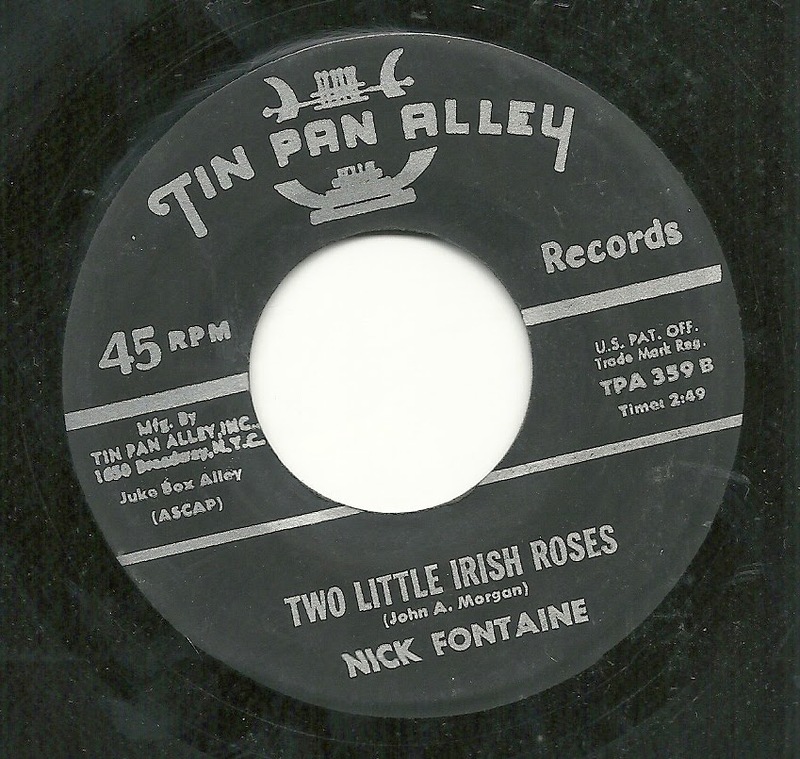 In this case, it's a circa 1965 record from Tin Pan Alley, "Two Little Irish Roses", sung by someone named Nick Fontaine. Mr. Fontaine's name appears on only two documented Tin Pan Alley discs, and only on one side of this one. His vocal is artless and struggles with varying success to stay on pitch throughout, but as this latter point is true of many who recorded for TPA after about 1963, there must be some other reason for his brief tenure with the label. Note that although the record is nearly three minutes long, there really aren't even two full verses here, and the record is padded by about 1/3 of its total length by one of the dullest instrumental passages imaginable. 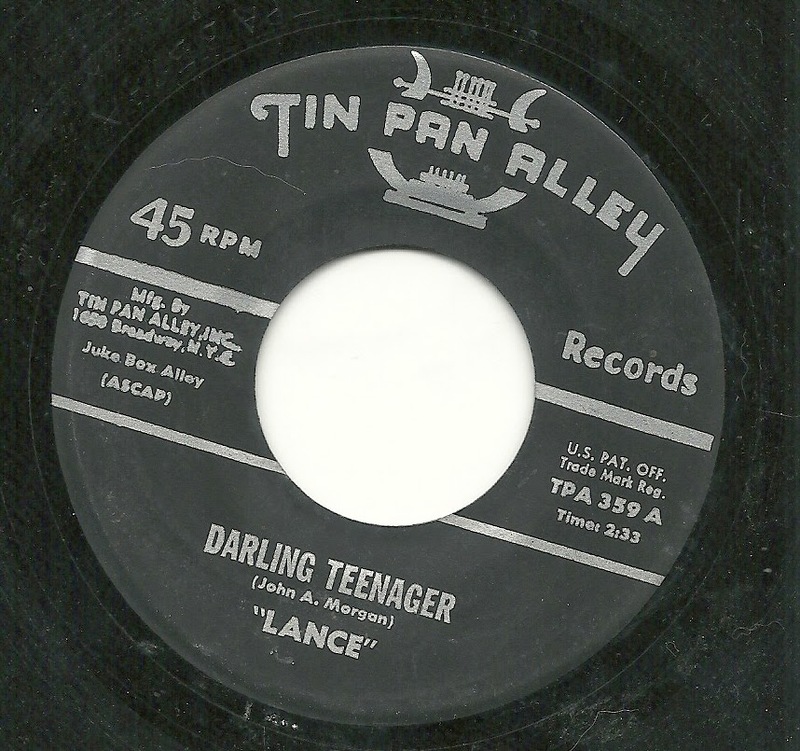 I wanted to make the post a tie-in to the holiday, and have done that, but the real meat on this disc is to be found on the non-Irish side, provided by our old pal "Lance" (as he was always credited), and a rollicking number titled "Darling Teenager". 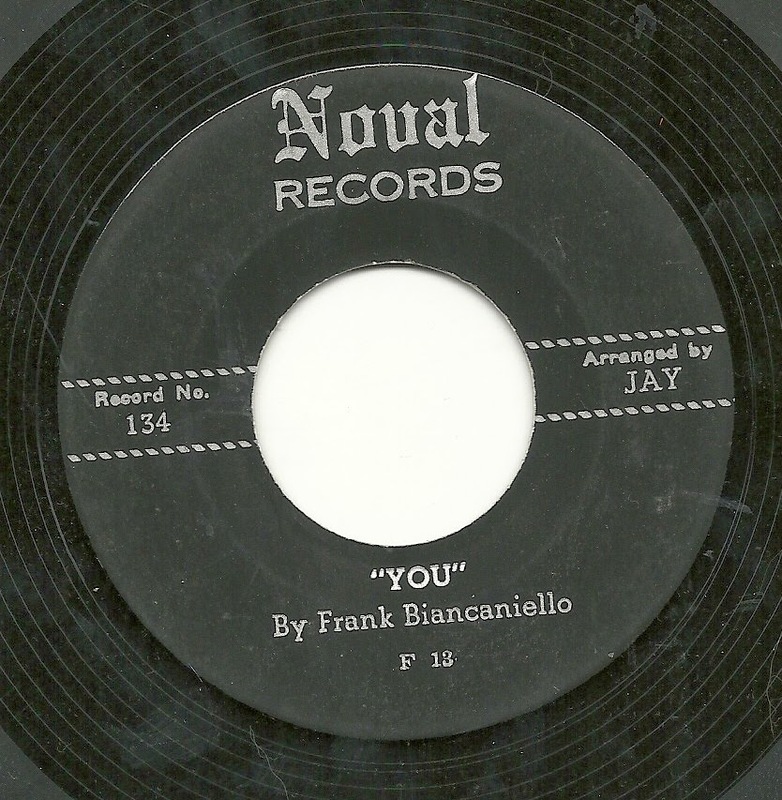 The surf-styled drum intro and doo-wop chords leading into the vocal tell you immediately that you're in for something fun, and the rest of the record doesn't let you down! Something about the pianist's style leads me to strongly believe this is a jazz guy slumming in the song-poem trenches - his chording, soloing and other licks just don't fit this style at all, which just adds to the sort of wonderful weirdness of the track. "Lance" isn't really up to the task (and rarely, if ever was, on his TPA sides), but at least he has something resembling a style. On the other hand, his shouted encouragements seemed canned - the one at 1:45 sounds exceptionally fake and cracks me up every time. In addition, this is another song where a couple of verses have been stretched out to the standard 150 seconds by an extended instrumental solo, although at least in this case, it has some energy. All in all, a very entertainingly weird track. 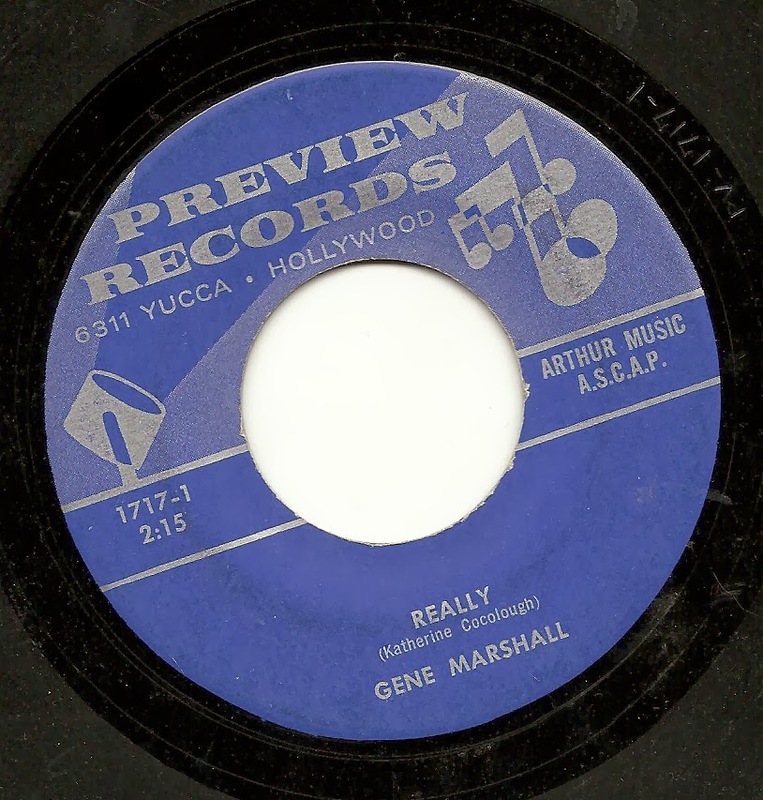 I'm frequently impressed by the energy, style and talent with which the Preview house band, and in particular, singer Gene Marshall, addressed material which was bland at best, potentially tedious at worst. It's certainly not always the case, but sometimes I come across a song which features better performances - even very attention worthy performances - than the song deserves. Today's offering is a prime example. The song, titled "Really", is not likely to set anyone aflame. Yet the the drummer and bass player seem to think they're backing up a top of the line Motown session, with a deeply soulful offering on the part of each. Whoever is working those Chamberlin strings isn't doing too shabbily, either. 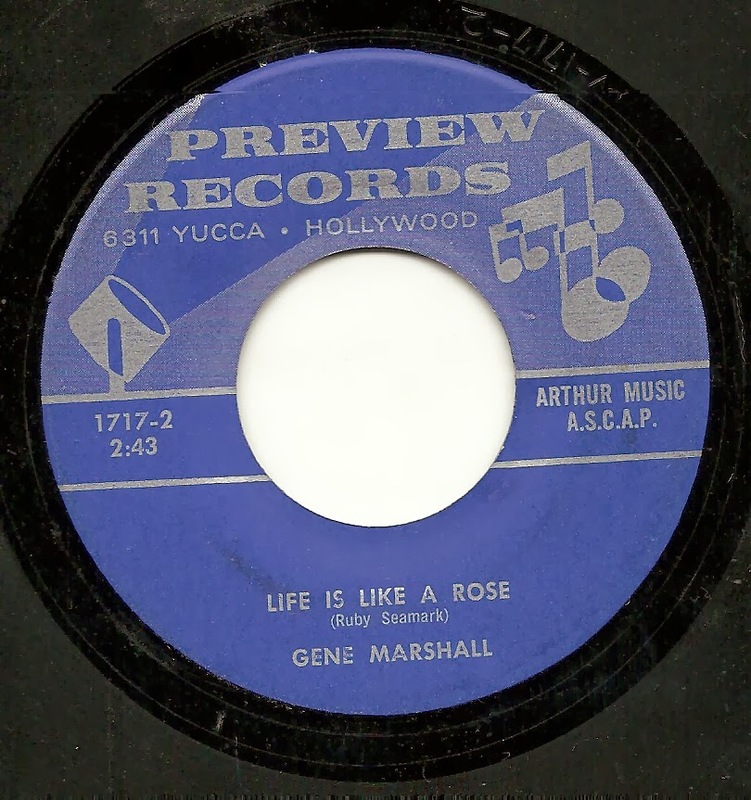 Saving the best for last, Gene Marshall gives it his all, with a warm, inviting vocal - I love the sound of his voice. By the way, the glitch beginning at 0:23 is right on the record - the sound muddies, and there is a tape glitch sound a second later. I'm guessing this was an imperfection in the reel tape used for the master, and presumably not caught (because, you know, who really cared?). The less said about "Life is Like a Rose", the better. It has none of the features of "Really". On the contrary, I find it to be badly recorded, with lackluster performances all around, particularly from the drummer, who doesn't always seem to be playing the same song as the rest of the band.